SUMMARY: Within value-based reimbursement, health coaches can play a critical role in managing the health of chronic care patients. Through the use of patient registries and the necessary skill sets, health coaches can drive population health management processes for the improved outcomes needed to succeed in a value-based system. 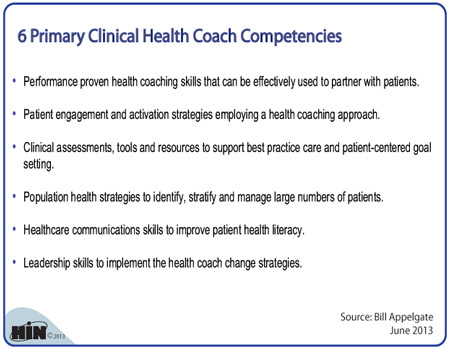 We wanted to share the six competencies of a primary clinical health coach identified by the Iowa Chronic Care Consortium. "We believe that you can change behaviors, and if you partner with patients, the likelihood of that is improving. That’s part of what we think is an important ingredient in a health coach training program. You need to use a health coaching approach, which is different than an educational approach. Your job doesn’t end when you’ve told somebody to do something; it ends or it moves forward. The journey continues when you get better outcomes with that individual and they are more capable in self-care." During this 45-minute webinar, Bill Appelgate, the executive director of the Iowa Chronic Care Consortium, shared how an evidence-based health coaching focus drives returns in a value-based payment delivery system. Health Coaching's Value in Accountable Care and Medical Homes is available from the Healthcare Intelligence Network for $129 by visiting our Online Bookstore or by calling toll-free (888) 446-3530.